June | 2011 | Is this thing on? Saturday home games are becoming my favorite day of the week. It gives me the rare opportunity to stay at home and spend time with my family, especially my 18 month old daughter Madeline. For a weekday game I’m usually at the park all day, but on Saturday I typically roll into Victory Field around 4:00. That’s precisely what I did yesterday and the Indians were taking batting practice. As I walked from the concourse down to the field I caught a glimpse of C Kris Watts. Wait a minute, what is Watts doing here? Immediately I started looking for regular catcher Eric Fryer. After not finding Fryer I approached Indians skipper Dean Treanor. Nine players have been promoted from Indianapolis since May 21 with an incredible five making their debut. Some of the call-ups have been due to injury while others have been well deserved. Regardless of how you get there; it’s the show and for five players it was a dream come true. Throughout this season Dean has mixed his message when delivering the good news to his players. He had fun with Daniel Moskos when he told him he was heading to the big leagues and was direct and to the point when informing Josh Harrison about his jump. Dean was on top of his game when he told Chase d’Arnaud he was going to Pittsburgh. Indianapolis is NL Central territory. The bulk of Indy’s baseball fans cheer for the Reds, Cardinals, or the Cubs. I’m not asking you to change your allegiance or even go out and buy a hat, but Indianapolis Indians fans should be checking on the Pittsburgh Pirates. I’m originally from Northeastern Ohio and it’s not in my DNA to like anything about Pittsburgh, but the 2011 Pirates are becoming a great story. (I reluctantly admit that I love the city…unique food…unique accents…and nice people. Well, except on a fall Sunday.) Today the Bucs will try to sweep a three game series from the Boston Red Sox. They enter the game with a 39-37 record and sit only 3 games behind the Central Division leading Brewers. I’m sure a team that is two games over .500 and 3 games out is nothing all that exciting to a casual baseball fan. What if I told you the Pirates have not had a winning season since 1992 and this is the latest point in a season they have been above .500 since 1999? Now would their current record and spot in the standing impress you? The last time the Pirates had a winning record Peyton Manning was a junior in HIGH SCHOOL. So, it’s been while for the baseball fans in Pittsburgh and what is making this year so special is all of the former Indianapolis Indians who are helping turn the franchise around. I’m not saying you have to be a fan of the Pirates, but we are all fans of former Indians players who succeed in the big leagues, right? Fourteen of the Pirates active 25 man roster on Sunday once wore an Indians uniform. Here’s hoping they get the sweep of the Sox and you cheer the sweep even if you are wearing a Reds cap. In the 5th inning Saturday night Andy Marte was at the plate trying to knock in the go ahead run from third base. I was calling the action from my seat behind home plate when all of a sudden Marte hit a foul ball in the air behind home plate and directly into my window. The foul ball smacked my right palm and fell right into my lap. Holy cow did Andy Marte get my attention and he got my right hand pretty good. Off the bat I could tell it was heading towards my window, but usually the ball hits below my spot and bounced into the seats. I always try to put on a brave face when a ball is hit back to me because 99% of the time it is going to miss me. I guess this was the 1%. At the last instant I slid to my left with my right hand in the air just off my shoulder and the ball found my palm. Let me stress that too you…the ball found my palm. If it were up to me, that ball would have missed me and dented the back of the radio booth. Instead it dented my palm and left me numb for a moment or two. I didn’t hold on to the ball instead at the inning break I tossed down the ball to a little kid who brought his glove. It was the last thing I expected and a reminder to watch out for foul balls. If you do see a fan make a great bare handed catch remember to give out a really loud cheer and ovation. It’s a heck of a catch and they will have the scars to prove it. Hope that you can join the Indians for Sunday’s broadcast on 1260 WNDE. The first pitch is at 2:05 and the first fans through the gate will receive an Indians BBQ Grill Set. On Monday afternoon a few of us were outside the Indians team hotel waiting for the shuttle. Before stopping at our hotel, the van stopped across the street and picked up a player for Lehigh Valley. When the van pulled up to pick us up the doors swung open and a familiar face was there to greet me. LHP Juan Perez (played for Indianapolis for parts of three seasons 2006-2008) gave me a big smile and said “Hey papi, how are you?” Juan and I sat together and did our best to catch up during the short 5 minute trip to the stadium. When the ride was over, I wished him the best and we exchanged a solid bro hug. “Jeez Scotty, why don’t you just take him out to lunch?” Brian Burres is always good for an occasional dig and he was getting on me for being friendly with a guy. I warned Burres that this was just the beginning because including Juan, there are six former Indianapolis Indians players on the Lehigh Valley Iron Pigs roster. It is common to run into a former Indian from time to time. This season INF Nick Green is playing with Norfolk, RHP Chris Bootcheck is pitching for Durham, and C Carlos Maldonado is with Syracuse. What is uncommon is to see SIX former players with one team. Six of the 24 man roster for the Phillies Triple-A affiliate once wore an Indians uniform. The players are OF Rich Thompson (’05-’06 1x All-Star), RHP Brian Bass (’10), OF Brandon Moss (’10 team MVP), C Erik Kratz (’09-’10 2x-IL All-Star), 1B/OF Tagg Bozied (’09), and Perez. All of the players are key reasons why the Pigs have the leagues 2nd best record and are winning for the first time in the franchises short history. Thompson has been with LHV since their inaugural season in 2008 and can see a different culture. “It is a lot better winning than it is losing and the experience on this team is incredible.” Of the current LHV roster only 6 players have not spent a day in the Major Leagues. Three of the six barley count because they just joined the team from Double-A Reading. “I’m having fun and everyone here knows that they can help the Phillies out. I’m still able to steal a base and one of the reasons I signed back with Philly is my speed may be an asset off their bench late in the season.” Thompson’s 21 stolen bases are the second most in the league and his first year skipper Ryne Sandberg has given Thompson the green light. Ryne Sandberg? Yup, the Chicago Cubs Hall of Fame 2B is in his first year on the LHV bench. Prior to the two games with the Indians he came out of the clubhouse about 25 minutes before first pitch and signed autographs for the kids who lined up along the Pigs dugout. He signed for about 20 minutes and then took the line-up card to home plate. He still wears #23 and coaches third base. When Sandberg failed to get the Cubs managerial job he left their oganization and signed with is original team. Remember this trade Philly fans? Juan Perez came to the Indians at the end of the 2006 season and was full-time in 2007 and 2008. “I really liked Indy. The stadium was unbelievable and I got my first call-up when I was there.” Juan is now 32 years old and the 160 pound lefty is still making life miserable for left-handed hitters. Tuesday night he struck out John Bowker and Alex Presley in a LOOGY situation. There was a lot of catching up on Monday and there will be a lot of good-byes when the series is all said and done on Thursday. It has been fun to catch up with so many players who played so well in and Indians uni. Over a month ago the Indianapolis Indians were playing at Norfolk. John Bowker was all set to join the team and the Indians needed to create some roster space. I’m sure most of the fans look at the players when they are at the park and evaluate them based on the numbers they see on the scoreboard. Which to some extent is fair, but inside the clubhouse everyone is vulnerable, even a player who spent the entire 2010 season in the Major Leagues. While in Norfolk the Indians were deciding what to do with Andy Marte. He was going to be the odd man out and May 8th he was removed from the Indians roster and added to the extended spring training roster. Marte was still with the team and working out, but in the background is agent was trying to find a better situation than the one with the Indians because he was not going to find playing time in Indy. Then on May 14 Corey Wimberly injured a lower leg muscle and went onto the Indians DL. The only move the Indians could make was to activate Marte. On May 14 the 27-year-old was batting .147 with 2 home runs and had produced a total of 14 runs in 25 games. “It was bad, really bad and I’ve started out slow in the past, but was given a chance to work through it. It got to the point where I was trying to do too much and I was desperate.” On the day Marte was added back to the roster he went 1-3 with an RBI 2B. He would go hitless in his next four games and again was worried he may be out of a job. Then on May 20th something clicked and Andy Marte not only saved his spot on the roster, but is helping save the Indians season. As for the offense, Gorkys is batting .464 during his hit streak and in June is batting .333 with a season best .472 slugging percentage. “When I’m not hitting I have to play defense, but it does feel good to get hits and help the team win.” Because Gorkys has been a prospect for three different teams (Tigers, Braves, Pirates) you forget he is still only 23 years old. Hope you can join the broadcast for tonight’s game. It is game three of this four games series with Lehigh Valley and game 7 of the 8 game trip. Pre-game coverage is at 6:45 with the first pitch at 7:05. You never know what will happen in the game of baseball. A team that is several games under .500 may win three out of four from a first place team or a powerless shortstop may hit one of the farthest home runs you have ever seen. Take for example Tuesday’s game between the Indians and Gwinnett Braves. It was a scoreless game going into the 9th inning when a ground ball to the right side of the infield bounced off the first base bag. The ball caromed into the outfield for a run scoring double and the Braves would beat the Indians 4-0. It was one of the many different bounces you will see during a baseball season and that bounce dropped the Indians to 33-34. When it comes to a baseball season usually the only thing you can count on is your travel plans. Well, most of the time anyway. You know all about the Indians 72 road games and it’s a fairly even split of air travel and bus travel. Thursday morning the team boarded a 6:15 am bus at Victory Field for the Indianapolis Airport. The Tribe checked in with no issues and as is usually the case, we went through the screening process with no issues. The team was scheduled to depart Indy for Chicago O’Hare at 8:10 am. The team boarded and everyone was ready for their 45 minute flight to Chicago when unexpectedly the pilots said we needed to get off the plane to fix a mechanical issue. Definitely not the end of the world and the team retreated back to the United Airlines wing of the airport. Tick…tick…tick…tick…tick…the delay was taking longer than the crew originally expected. It was becoming apparent that the 9:37 am CST Chicago flight to Rochester was in danger. Manager Dean Treanor and athletic trainer Brian “Bubba” Housand immediately began to work their cellphones. The two of them were in contact with the Indians front office and the Pittsburgh Pirates travel agent to find the team a new flight to Rochester. The first available flight from Chicago was at 1:00 and only had 13 seats open. Thirteen? Well, that’s not going to work. A few minutes later two more seats opened up and within the hour a total of 20 seats had opened up for the 1:00 flight from Chicago to Rochester. At this point it is 9:30 am and Dean is confident the game with the Red Wings will go on. “I don’t want to start the game without my full squad, but under the circumstances there isn’t much I can do. I can field a team with 20 guys. It’s not ideal, but we will make due.” The question was…will the team make it to Chicago? Dean drew up a list of 20 names that would be on the 1:00 flight to Rochester. He decided to take the coaches, Bubba, all position players, and most of the relievers. Two relievers, Jose Ascanio (added to the roster when he was outrighted from Pittsburgh to Indianapolis and RHP Anthony Claggett was sent back to Double-A) and LHP Justin Thomas did not fly with the team and would meet the team in Rochester. 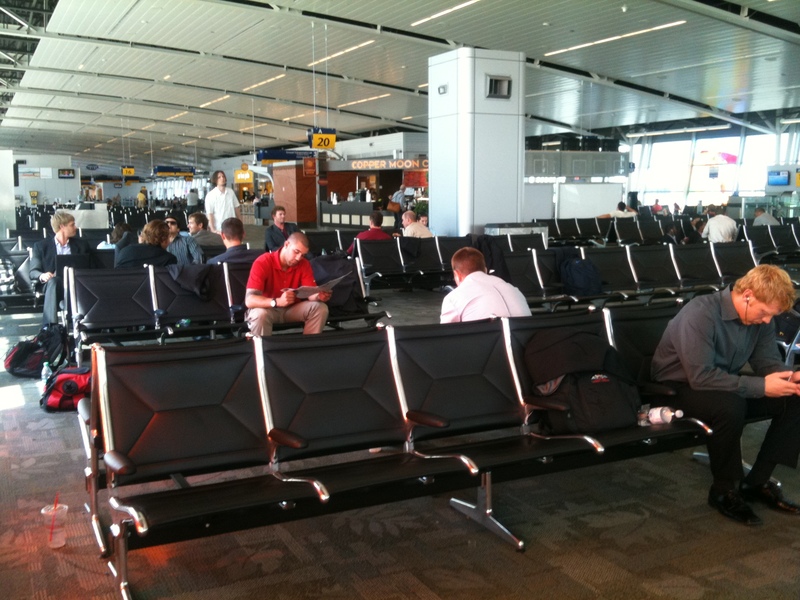 The players who remain in Chicago and wait for a much later flight would be the broadcasters (really? C’mon Dean, is there really a game if there is no broadcast? Actually, I completely understood) and starting pitchers. Only vital parts of the team would make the first flight to Rochester while everyone else would likely be getting into town around 9 pm. Tick…tick…tick…tick…tick…the delay was taking much longer than the crew originally expected. Now it is 11 am and the luggage was still sitting on the tarmac. Now the 1:00 flight out of Chicago was in doubt and the team started to look into plan B. Turns out, there wasn’t a plan B because this doesn’t happen and is one of the reasons why we usually fly out around or before 8 am. (Plan B was to find a charter…not happening…or find a bus to just get out of Indy and to Rochester as quick as possible. That was not an option for several reasons and we had to keep our fingers crossed for a flight. For a brief moment we considered flying out of Louisville or Cincinnati, but the problem is not a lot of flights go to Rochester.) For the first time all morning I was beginning to think there would not be a game. However, with the quick flight time, you figured if the team left Indy at 12:30 we could have a chance to make the 1:00 CST flight. As the morning progressed my plans changed. Now I, along with RHP Brad Lincoln, LHP Justin Thomas, and LHP Garrett Olson was going to be on a 1:50 flight to Rochester. I’m feeling good because I would make the game and the remaining 4 team members would arrive in Rochester around 8 pm. Well, the 12:30 mark passed and the next thing you know it is 1:00. Finally, at 1:15 the team boards and with the one hour difference there was going to be a chance to catch the flight. We were told the 1:00 to Rochester was going to be held for us up to 30 minutes. There was zero chance the luggage was going to make the trip, but the players would make the trip and the game would go on. Catching a connecting plane was one thing…calming down the players who were getting on a “fixed” plane was another. More than a few guys expressed some apprehensiveness about getting on the plane. Truth be told, I’m not the biggest fan of flying, but I’m used to it. I told a few guys “If it’s good enough for the pilot than it is good enough for us. Remember, he was the one that didn’t want to fly the first plane. He is in charge and knows what the best is for everyone.” If guys were nervous they hid it well as we took to the skies. WHAT!? I was sitting behind Bubba and he dropped his head into his hands. At that moment we knew there was not going to be a game. So much for the 30 minute hold at the gate and now 20 players are no longer getting to Rochester on time. As the team approached the gate we learned the 1:00 flight not only didn’t wait, but took off 3 minutes early. Thanks United! The other flights (mine at 1:50 and the other at 4:30) never materialized because the tickets were not transferred by United to American Airlines. Now it is 1:30 in Chicago and 4 and ½ hours from first pitch in Rochester. You never believe that you will miss a game and for a brief minute we are hoping to hear some kind of good news. It never came. No flights could accommodate enough players to allow the game with the Red Wings to go on. Dean called the team together at United gate C 11, “There will be no game and we need to issue you different tickets. We are all on standby for the rest of the afternoon, but we will likely be on three different flights. All I ask is don’t miss your flight. Hang with ‘em” Dean later told me that the ticketing agent really took care of us. “When we approached her there was nothing, I mean nothing. She is the reason we didn’t stay the night in Chicago.” A big thanks to her. Only one player, Burres was on the 4:30 flight with most of the team on a 6:30 flight. I was on the 9:30 flight with Bowker, Alex Presley, Chase d’Arnaud, Brian Friday, Andrew Lambo, Corey Wimberly, and Friday’s starting pitcher Rudy Owens. When the staff and most of the team boarded the 6:30 flight the 9:30 crew headed off to Chili’s for some dinner. About an hour into our meal Wimberly’s phone rings and it was Andy Marte. Wait a minute…Marte is on the 6:30 flight…he can’t call you? Turns out the 6:30 flight was being delayed because of a mechanical issue similar to the one that grounded our flight in Indy! What are the odds? Seriously, call Elias and find me the odds. After a THREE hour delay they boarded a different plane and finally left for Rochester. The original 9:30 crew headed to the gate waiting for our flight. To be honest we loved the fact that the group on the 6:30 flight had some problems because they kept rubbing it in that they would get in 3 hours before us. Sorry, fellas, don’t jinx air travel and it was turning out better to be on the later flight; for a moment anyway. When we arrived at our gate we were told our 9:30 was pushed back to 10:37. Of course it was, and when we finally boarded our flight to Rochester we left a full 13 hours after our first scheduled flight. When it was all said and done the final members of the travel party checked into the Rochester Plaza Hotel at 1:30 am….for me it was 20 hours after I left my house. There is no one to blame for the travel issues because United had mechanical issues and there were other people on the flight who were affected. I have never missed a game due to travel and this was the first time since 2006 when a flight affected an Indians game. In August of ’06 the Indians were delayed flying out of Norfolk and pushed back the start time at Victory Field from 7 pm to 8 pm. Never have I been stranded in an airport and wasted a full day. You know something…on second thought…maybe there is someone to blame for the mess. On Wednesday night my wife was cleaning out her car and brought an umbrella into the house. Of course our 18th month old daughter’s eyes lit up when she was handed the umbrella. Thanks babe, and now you have the rest of the story. The Indians and Rochester Red Wings were forced to postpone the game and it will be made up on Saturday as a day-night doubleheader. The Indians rotation will remain the same with Owens going Friday night and Burres and Wilson pitching on Saturday. Lincoln will handle the finale. RHP Blaine Boyer opened the season with the New York Mets and when he was released signed with the Pirates in mid-April. His contract allowed for him to opt out and when that initial date arrived he resigned for a month. Well, the second deadline is approaching and Boyer is no longer with the club. He has been on the DL since June 1st and it appeared he was close to being activated. However, he was granted his release and is a free agent. The Rochester Red Wings will send 2009 Indianapolis Indians RHP Eric Hacker to the mound on Saturday night. Hacker joined the Tribe during the ’09 season when he was acquired by the New York Yankees. Hacker was 5-5 in 21 starts for the Indians with a 4.02 ERA. He won 16 games last year with Triple-A Fresno and this year is 2-5 with a 5.27 ERA with Rochester. On Sunday the Indians will face Greenfield Central’s Kyle Gibson. Gibson was a 1st round pick out of Missouri in 2009 and is having a very good Triple-A season. He is 3-6 with a 3.79 ERA and has 74 strikeouts in 71 innings of work. Gibson will face Lincoln Sunday afternoon. @EdmundRollett: there’s also a degree of question as to how legit the tools are. one is reminded of Pearce and Eldred tearing thru minors–Fair comment, I did not see Eldred’s 2005 rise, but did see the climb for Pearce. Injuries really sapped Pearce’s power and he was never as consistent as Presley has been. @indycouse: yes but we want a title here in Indy first–Spoken like a true Indianapolis Indians fan who have watched a few mid-season runs derailed due to call-ups. The challenging part of Triple-A baseball for any fan. If only it was as easy as having the numbers and getting a call to the Major Leagues. In the past month OF Alex Presley has watched SS Pedro Ciriaco (.448 OPS in 36 games with Indy), INF Josh Harrison (.816 OPS in 37 games), C Dusty Brown (.883 in 30 games), and finally C Wyatt Toregas (1-29 in 11 games) all join the Pittsburgh Pirates. Are any of those players better than Presley or more deserving? No, and Manager Dean Treanor knows it. “Too bad he’s not a catcher or a shortstop, but that’s baseball. This game isn’t fair and believe me the Pirates are very aware of what he has been doing here. They are not ignoring him, but now is not his time.” The players who have gone to Pittsburgh have done so because of injuries. The only chance that Presley had of going up was in late April, but the Pirates elected instead to sign OF Xavier Paul from the Dodgers. Like today, the timing in April was not right for Presley. No one in baseball is going to feel sorry for Presley, but everyone appreciates the daily effort he puts in. Presley is not the first or the last player to be blocked from a Major League spot. It just so happens this is the first time it has happened to a position player while the Indians have been affiliated with the Pirates. In the past a really good 30 or 50 games stretch would put you in Pittsburgh. However, with improved play and better talent the times have changed and it must be nice for the Pirates to know they have a player they can call on when needed. The good news and the bad news is that Presley may not have to wait much longer. David Todd is the host of the Pirates postgame radio show and believes Presley arrival will be sooner than later. A recent conversation he had with Pirates Manager Clint Hurdle leads Todd to believe that Presley may be an option next weekend when interleague play starts back up. If that is the case, then Indians fan will want to be at Victory Field Saturday through Tuesday and catch another glimpse of the left-handed hitter. It may not be his last visit to Indianapolis, but you never know, he may get a his shot and stay at the Major League level. Presley is the type of player who makes the most of every opportunity and for the past 12 months he has been the most consistent and reliable Indians player I have watched during my short time. **It’s true, when I look at his game from his arrival in late June of 2010 to today no player has put together a 130 game run like Presley. Andrew McCutchen from June of ’08 through May ’09 was really good, but not consistently good (He was also only 22 years old). The only player who managed to consistently deliver was Jose Tabata from August ’09 through June ’10. Tabata only played in 85 career Triple-A games and is now going to be a Major League player until the day he retires. Following tonight’s game with Buffalo the Indians will ride back home on a sleeper bus. This evening’s game can be heard on SportsRadio 1260 WNDE at 7:15 with the first pitch from Coco-Cola Field set for 7:35. LHP Rudy Owens is on the mound as the Indians try to take 3 out of 4 games on the Bison home field for the third consecutive season. Hope to see you at Victory Field this weekend as the Gwinnett Braves make their only visit to Indianapolis. The four game series with the G-Braves will concluded on Tuesday night. The NBA Finals are a major topic within the Indians clubhouse, but this blog entry has more to do with the Tribe’s recent winning ways and not the hoops. In case you are wondering most of the locker room is pulling for the Dallas Mavericks and the players who don’t care have been locked in because the games had provided high drama. Needless to say, but over the past few weeks the Indians clubhouse has been a much happier place. Remember the 1-8 start or the Indians losing to Durham on May 11th and falling to 11-23? Losing can cause problems with a fan base and within a clubhouse, but the Indianapolis Indians never let the losing bother them. Little did the Indians know that their season would begin to turn around on May 12th. That night the Tribe beat Durham behind 6 no-hit inning by LHP Justin Wilson. Winning is great, but it is always nice to win the last game of a road trip. It makes the long travel home a little easier and it gives you confidence as you head to your own park. When the Indians got back to Indy for a May 13th showdown with Columbus, Manager Dean Treanor and I mapped out the next 30 games. Looking at the schedule (30 games…16 at home…and 16 vs. teams with winning records) it was entirely possible the Indians could go 20-10 and have a record of 31-33 with 80 games to play. At the time the important number to Dean was the 80 games remaining. “If the team is at or near .500, then you can make a charge. The season really picks up in June and more often than not teams change over their roster and then anything can happen.” Well, wouldn’t you know it…the Indianapolis Indians are right where Dean wants them to be. Since May 12th the Indians 18-8 record is the best in the league and enter Wednesday nights game in Buffalo with a 29-31 record. In the past 26 games the pitching staff has a 3.55 ERA and as a team the Indians are batting .292. I’m not sure where those two numbers rank in the league, but they have to be near the top. Throw in the 5.3 runs per game and the Indians are playing their best baseball of the season. The Indians still have some work to do before reaching .500, but I do have to give a lot of credit to Dean. He believed in his team and did foresee the chance for his club to win 20 of their next 30 games. Looks like the young Indians are rebounding for their poor start. Only 3B Andy Marte (played for Buffalo), C Wyatt Toregas (while with Columbus), and 2B Shelby Ford (2009 with the Indians) are the only offensive players who have played in Buffalo. SS/2B Chase d’Arnaud is back in action and picking up right where he left off. d’Arnaud went on the Indians disabled list May 23 with a groin injury. He was activated on June 2nd and since returning is 7-17 with 5 runs and 4 runs batted in. “Dean helped me out by playing me every other day. I didn’t realize how sore I was going to be after playing a full 9 inning game. I guess I didn’t know how much your body can change after sitting for 10 days. I really needed the rest, but now I feel good and can go everyday.” Like Hague, d’Arnaud has been on tear since May 12th batting .387 with a .423 on-base percentage. Wednesday LHP Garrett Olson will make the start for the Indians. He is pitching for the first time since May 14th when he suffered an oblique strain that landed him on the DL. RHP Brad Lincoln was the scheduled starter, but he will have his turned skipped because of a minor neck strain. Not sure when or how it happened, but it does not appear to be serious, but it will prevent him from making his scheduled start. Coca-Cola Field has added one of the most impressive HD video boards I have ever seen. It cost a pretty penny (2.7 million) and it was worth it. Here a photo I snapped from the press box. I hope that gives you an idea of its size and at the time of the photo the MLB Network was interviewing San Diego Padres skipper Bud Black. I snapped the picture from my crummy phone and you can still see how crystal clear the video board is. 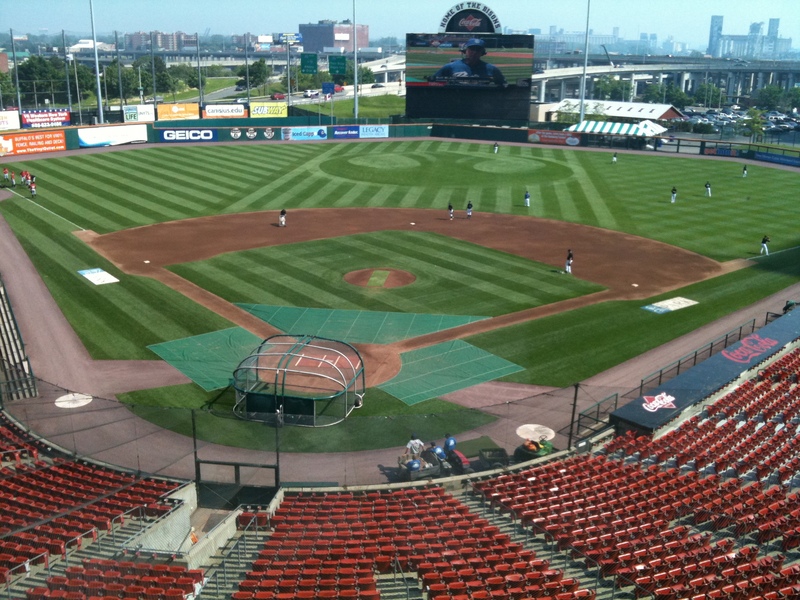 Major props to the Bisons for the addition. Hope you can tune into the radio broadcast on Sportsradio 1260 WNDE or the i heart radio app on your smart phone. Game time is set for 7:05 from Buffalo where the Indians have won 7 of the last 9 times. After a Wednesday afternoon loss the Indianapolis Indians walked into their clubhouse losers in 3 of the past four games and appeared to be on the brink. Although a 3-3 record over six days is nothing to be concerned about, the Indians needed to rally late (9th inning on Friday, erase 7-0 deficit Saturday, and 4 run 7th inning Monday) to win those three games. The last thing I want to do is overreact, but Thursday night was a critical game for the Tribe. Would LHP Justin Wilson bounce back from a career worst start? Can the offense put up a crooked number? Will the Indians win a game going away? It had been two weeks since the Indians won a game by more than 3 runs and it was time for a blowout. Well, I got what I wanted and then some. Wilson allowed 2 unearned runs in the 1st inning and was on the ropes in the 3rd inning. The Yankees had the bases loaded with two outs and a right-handed hitter at the plate. Wilson fell behind 2-0 and took a moment to walk behind the mound. “That was a situation where I had to let it fly. I was in a hole and it was time to go for it” The batter missed a 93 miles per hour fastball and missed on another 92 miles per hour heater. “Honestly I don’t really remember much other than I needed an out.” With the count 2-2 and the bases loaded, Justin Wilson threw a fastball on the outside corner to freeze the Yankee righty and end the inning. Scranton would not get a hit against Wilson the rest of the night. Pitching coach Tom Filer was waiting for a sign of life from Wilson and he got it. “His last two starts were missing that extra giddy-up. He didn’t have life on the ball and the results showed that. Last night (Thursday) he had life and his fastball had that extra jump. He hit 95 in the 6th inning and the key is to find that trigger that turns him into an aggressive type of pitcher.” Filer believes Wilson has more work to do, but for the first time in three starts he once again saw life in the left-handers pitches. In the 2nd inning Miles Durham drilled an opposite field double to score three and give the Indians the lead. The score would remain 3-2 into the bottom of the 4th inning and Alex Presley took over. The International League’s leading hitter hit the first of his two 3 run home runs in the 4th inning. In the 5th inning he made a leaping catch at the wall in left-center field to take away extra-bases. “I felt like Jordan; I had a good read and timed my jump and grab it above the wall.” A three run home run and a highlight reel catch is a full nights work, unless you are Alex Presley. His 8th inning 3 run home run turned the game into a rout and gave the 25 year-old-lefty his team leading 8th blast of the season and now the team lead in RBI. Manager Dean Treanor is more than pleased with what he has seen from Presley this season. “The big key is what do you do with a pitch you can hit. The good ones take advantage of a pitch regardless of the count. It doesn’t matter if he is hitting 3-0, 3-1, or with two strikes, he is focused on his pitch and drilling it.” Coming into this season the Pittsburgh Pirates wanted Presley to work on his base running. He always had quickness, but it never translated into stolen bases. “That was an aspect he needed to add to his game. Typical Presley, he focused on it and he is doing exactly what is asked of him.” Presley’s 13 stolen bases are the 3rd most in the league. Minor League baseball is now starting up the All-Star voting campaign. Vote as many times as you would like and Alex Presley should receive your vote. When it was all said and done the Indians did see Wilson bounce back and thanks to three swings that produced 9 runs the Indians won going away 13-2. Next up is a four games series with Syracuse. Late Thursday night I tweeted “New delivery is working for Chris Leroux. Last 5 games 0 runs 9.2 innings. Hit 96 a couple of times including K of league HR leader.” I noticed it was retweeted several times and feel like you deserve some information. On May 1st the righty allowed 3 runs in an inning of work. Up to that point in the season only 55% of his 280 pitches were for strikes and his earned run average was an unsettling 6.92. Pirates minor league pitching coordinator Jim Benedict was watching old video tape of Leroux and had an idea. Leroux explains “a few years ago my arm action was three-quarters and I was more deceptive with the ball. I didn’t realize that I was pitching more over the top and through the years had actually raised arm slot.” Benedict is a fan of video tape and is currently working with RHP Sean Gallagher and RHP Blaine Boyer on lowering their arm action to three-quarters. In the early going the move has been more beneficial for Leroux. “I was sent to Double-A and Jim (Benedict) told me that it was not a demotion, but the place where I needed to work on the new delivery. After a couple of weeks he told me that I’d be back up and he was right.” In addition to the new arm action Chris Leroux has changed his slider. “I used to throw a slurve, but after Tommy John surgery the Florida Marlins told me to scrap the pitch and use a slider. My slider was always good, but not great and now I’m back trying out my slurve.” The results showed Thursday night. His new breaking ball had noticeable bite and couple that pitch with his 96 mph fastball and the Indians have a new pitcher. Since returning from Double-A Chris Leroux is throwing 62% of his pitches for strikes and has not allowed a run in five appearances. I want to thank all of the readers for the positive feedback from the blog entries on Tim Wood and the recent promotions. 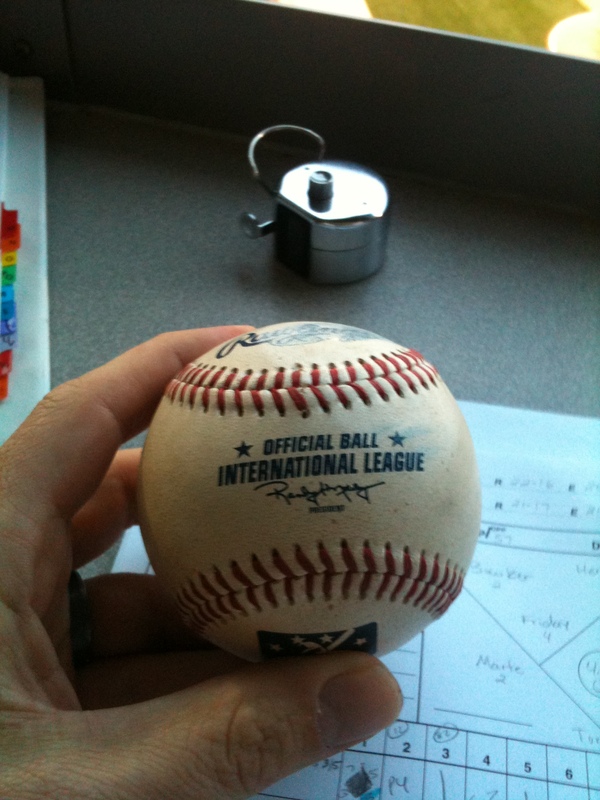 It really means a lot that you enjoy the blog and enjoy following the Indianapolis Indians. It sounds very corny, but I like about the Tribe and writing for you. Tonight the Indians open a four game series with the Syracuse Chiefs. The is no DH for the four game set and the next 12 games will be played under National League rules. The rotation for the Syracuse series will begin Friday night with Brad Lincoln, followed by Sean Gallagher, Rudy Owens, and then Brian Burres. Hope you can tune into the broadcasts on wnde.com or 1260 am Indianapolis on the iheartradio app. Sunday evening I was preparing for the Indians pre-game show. It was 5:40 pm, 5 minutes before air time and I decided to check out my Twitter timeline to see what was happening. I learned there was an injury to Pittsburgh Pirates catcher Ryan Doumit. According to Twitter, he injured his ankle on a play at the plate and was taken out of the game. My next thought was to look out onto the field and see if Indians catcher Dusty Brown would remain in the Indians starting line-up or if he would be pulled. Inside the visiting clubhouse the Indians were watching the Cubs and Pirates game on WGN. They watched the play in which Doumit was injured. The first man to speak up was catcher Wyatt Toregas. “Hey Brownie, pack your bags you’re going to the bigs!” Dusty Brown was on his way out of the clubhouse and minutes away from warming up starting pitcher Brad Lincoln. He turned around and said “Are you serious? What’s going on?” Within a minute Toregas was putting on his gear and Brown was pulled from the game. It turns out that was the first of many dominoes to fall on this Sunday May 29th. As the Indians and Pawtucket Red Sox played on Sunday night more news started to trickle out via Twitter. The Pirates had not made a decision on Doumit, but did place INF Steve Pearce on the disabled list. News of this move arrived while the Indians were in the 7th inning. Now it was looking like the Indians would not only lose Brown, but perhaps an infielder. The question was, who? No one was removed from the Indians game and the two candidates for the promotion could be 3B Andy Marte and INF Josh Harrison. Marte has Major League experience and was currently crushing the ball, but Harrison was streaking as well. The previous night he went 5-5 as the Indians erased a 7 run deficit. All I could do was wait and see because both were going to finish the game. After the final out the 20 minute post-game show commenced and another 10 minutes would be needed for me to pack up the radio equipment. Nearly 30 minutes had passed since the final out when I entered the Tribe clubhouse. At first glance Josh Harrison was not at his locker stall and Andy Marte was showered, dressed, and talking on the phone. He didn’t appear to overly happy, but he didn’t look disappointed. I couldn’t tell if he got the promotion and thought maybe he was being cool about it because it was not his first promotion. At about that time I overheard Chase d’Arnaud ask “what time is your flight?” The next voice was that of Harrison “I think 7, but I’m not sure.” I had my answer, Josh Harrison, for the first time in his career was going to the big leagues. Dusty Brown and Harrison were on the shuttle and both had their bags packed for NY. Like Harrison, Dusty was busy working the phone and he knows this is not the best way to get a call-up, but injuries are a part of the game. When a player goes on the DL you are not sure if you are going to bigs for two weeks or two months. You just know you are going to Majors and if things fall your way, you may not come back to the minors. It was 10:30 pm and the last of the Indianapolis Indians were arriving at the team hotel. A 5:00 am bus to the airport was set for the next day and players retired to their rooms. In Binghamton NY the Double-A Altoona Curve were resting in their hotel. Curve Manager PJ Forbes was in his room and set to make three phone calls. He dialed Shelby Ford, Eric Fryer, and Miles Durham. Individually the players when to his room and he alerted them they were going to Triple-A Indy. Eric Fryer is a C and OF and was having a great start to the season. “I didn’t know what was going on. I went to his room and he told me I was going up. We were going to catch a flight to Philly and either be on the team flight to Indy or another flight, but I knew it would be a crazy day.” Fryer, Ford, and Durham did meet the Indians at the Philadelphia airport. They didn’t look like they were prepared for a promotion. The Indians may not travel in style and sit in coach with the rest of you, but they do look good. The players and staff where suits (including the broadcasters) and always look professional. When the three new players met us they were wearing jeans…non collared shirts…and one had on a hat. Just a guess, but there may be a kangaroo court fine in their future. All three players capped off their long day by playing Monday night vs. Scranton. Ford made a triumphant return with three hits and Fryer’s first career Triple-A hit was a ground rule double that bounced on the warning track over the 405 sign in CF. Durham would go hitless, but the INF/OF would get his first three A hit a night later with a double inside the third base bag. While the three players from Altoona chipped in for the Indians it was quite a Tuesday night for Harrison and Brown. Browns collected his first Pirates hit and Harrison was in the starting lineup. He not only collected his first ML hit, but he came up with a late game tying RBI, his first in the bigs. His game tying hit sparked the Bucs who would go on to win and Harrison was the star. 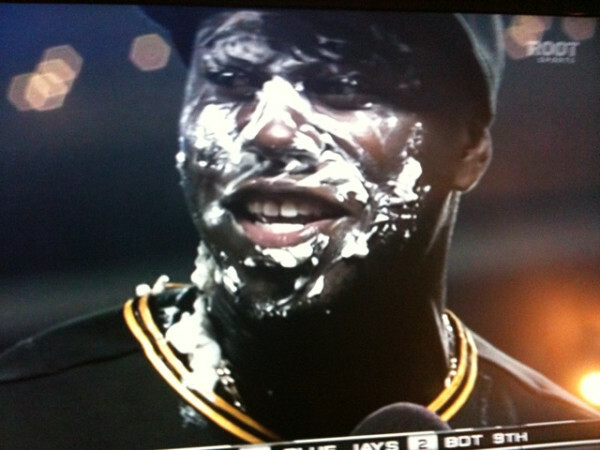 Saturday night in Pawtucket, Corey Wimberly gave Harrison a shaving cream pie and on Tuesday Paul Maholm gave him a Major League pie in the face. 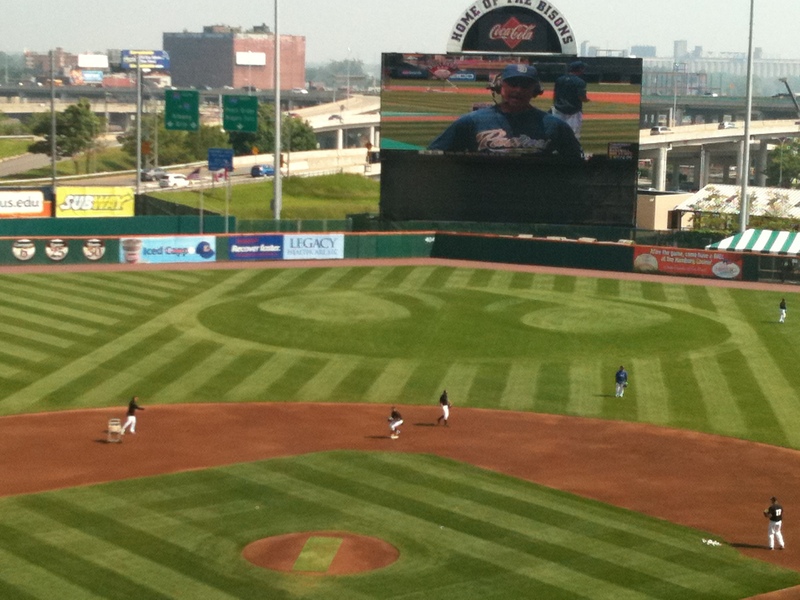 Good luck to the new Pirates and you can see the new Indians at Victory Field. The Tribe is in town through Monday.